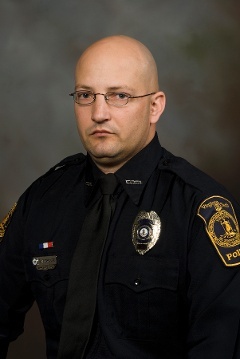 Officer Deriek Crouse was shot and killed while making a traffic stop in the parking lot of the university's Cassell Coliseum, near McComas Hall, at approximately 12:15 pm. At some point during the stop, a suspect unrelated to the traffic stop approached his unmarked car and shot him once in the head as he sat in his vehicle. The suspect fled on foot to a nearby location on campus and changed clothes. He was located in the university's I-Lot approximately 45 minutes after the shooting and committed suicide as a Montgomery County deputy attempted to contact him. Officer Crouse was a U.S. Army veteran of Operation Iraqi Freedom and had served with the Virginia Tech Police Department for four years. He had previously served with the Montgomery County Sheriff's Office and New River Valley Regional Jail. He is survived by his wife, five children, mother, and brother. Every year as we decorate for Christmas, we put a blue light in our window in your memory. You're never forgotten.